In my previous post I wrote a short piece about planning the writing process, and touched upon the importance of good editing. In this article I’ll be looking at the editing process; or more accurately, the first stage of the process. My degree is in teaching, and my specialism was in English. Whilst studying English comprehension and its application, we considered how to teach and how to assess English comprehension at three levels: text level, word level and sentence level. At text level you look at whether the child understands the composition as a whole. Can they tell you what kind of text they are reading? What conventions does it hold that make it a part of a particular genre? Can they describe the narrative? Can they follow a character’s arc through the piece? What are the themes? At sentence level assess whether or not they can understand the meaning of individual sentences, or sometimes paragraphs, in the text. What purpose do those sentences serve? Are they exposition? Do they move the story forward? Do they help you understand a character better? How? Is the information presented baldly, or can you use some inference and deduction to draw out the point the author is making? What does all of this have to do with editing a document? Well, the three levels of reading comprehension are reflective of the three levels of editing. At a text level you are looking at how the novel works as a whole. Does the story make sense? Are the character’s arcs in place? Would the information be better presented in a different order, or even a different manner such as an extra scene rather than a flashback or expositional dialogue, for example? In this entry I will be concentrating on text-level editing, as it is the level that should always be tackled first. Here you may find yourself excising chunks of text, or moving and rewriting sections, or writing entirely new ones. Until you’re satisfied with the structure of your novel there’s little point in dealing with the details. The four sections of The Tor’s narrative take place in consecutive decades with a combination of recurring characters and those who appear only in a single section. These are interspersed with sections that serve to give a broader history of the tor. Aside from these interludes the narrative unfolds without flashbacks or exposition, so this first level of editing required me to ensure that it all made sense; for example by ensuring that no characters find themselves privy to information that it would not make sense for them to know. As I am looking at only the first draft I know there are going to be times where I have given the reader information in a very basic, direct fashion, whereas it would be far more enriching for the narrative if I edit those parts so that, for example, a character within the story discovers or observes the events and experiences the consequences as opposed to having in narrated to them. There are also many sections, in fact far more than I would have expected, in which the old adage ‘show, don’t tell’, has had to be applied. I had expected to remove many unnecessary, repeated, or just hurriedly written parts of The Tor. I also expected many parts to be rewritten. But I’m surprised at how many parts I’ve had to expand upon. So far it has been interesting and challenging work. The process of critically appraising my own writing has given me a new perspective in my own creative process, and I look forward to finding out how it has changed as a result when I come to edit my next novel. It’s been fun, and a Hell of a lot of work. I’ve learned plenty, too. Writing The Tor has been a very different experience than writing Reformed, not least because the latter was conceived as a collection of short stories whereas The Tor was always going to be a novel. I’m certainly a stronger writer, having had enough time now to critically appraise Reformed from a longer perspective, and I’ve a far better understanding of the editing process also – one of my future projects will be a rewritten Reformed, together with a sequel. Reformed has garnered four and five star reviews, and I remain convinced that better editing on my part would have boosted the four stars to five. The main thing I’ve come to appreciate during this process is the importance of planning – both in terms of the novel’s structure and in terms of planning the time spent writing. With regard to planning the structure, I found it really useful to ‘sketch out’ the entire book from start to finish. The next stage was to divide the sketch into chapters – each chapter at this point consisting of a few sentences that summarised what was to happen. Then I expanded each section, adding detail and action. Often at this stage I find myself breaking the chapters up further as my writing expanded the content of each section. Then it was a case of going through the whole document so that it felt it feels like a cohesive body of work rather than disjointed sections, or detailed notes. This, I think, is as close to a formalised writing process as I’m ever going to get. As I write this I have already more-or-less sketched out my next horror novel, The Swarm, and compiled a notebook full of ideas for my urban fantasy horror The Angelcutter. It sounds more complex than just ploughing on with writing, but really it’s a far quicker, more organised way of doing things. Think of it as drawing up the building plans for a new house and then working from the foundations to the roof, rather than picking an arbitrary starting point and trying to build room by room and having to adjust what you’ve already built in order to accommodate new extensions. Not that I actually start at the beginning and work my way chronologically through the text; my ideas for key events and scenes still come out pretty much in a random order, but putting the sketched versions of those ideas together before starting the ‘proper’ writing speeds up the overall process by far more than you’d think. When you have a good idea of where you’re going, the route is always more straightforward. With regard to planning my time… well, this only comes with experience, and is something I’m still working on. Day to day, juggling writing time amongst your many other commitments is always going to be a challenge: at least until you’re successful enough to write full-time. But what I’m referring to here is medium and long term planning for your novel. How long to plan, how long to write the initial draft, to redraft, to edit, to proofread… again, the nature and size of The Tor has meant that not only has each stage so far taken longer than it did for Reformed, it also took much longer than my initial estimates. When I first started to plan The Tor I really did expect to have it available by the end of July; yet here we are in August with the first draft nearly complete, and the editing and final proofing still to do. The Gantt chart I created to plan The Tor and the three or four following projects is hopelessly out of date. The rule for estimating timescales so far seems to have been ‘double it, and add 10%’. I’m sure I’ll get better at it. But as well as the importance of planning, I’ve also come to develop a deeper appreciation of the language used in the books I read. An author’s choice of words can have a great effect on a reader’s engagement. An obvious statement perhaps, but until you are in the position of having to express even a simple sentence to a reader, it may not be something you’ve considered. Plot, certainly, along with characters and setting are vitally important; but the vocabulary choices of the author can change the feel of a whole piece of text. Why did that character ‘run’ across the field? Why not ‘sprint’? Or ‘dart’? And why ‘across’ the field as opposed to ‘over’ or ‘through’? Small choices can affect the reader dramatica lly, and as I begin the editing process (a task as arduous as writing the first draft), word choice is just one of the factors I’ll be looking at. I’ll blog about editing another time; until then, happy reading and writing! The Tor is scheduled for release this Autumn, via Kindle and Createspace. 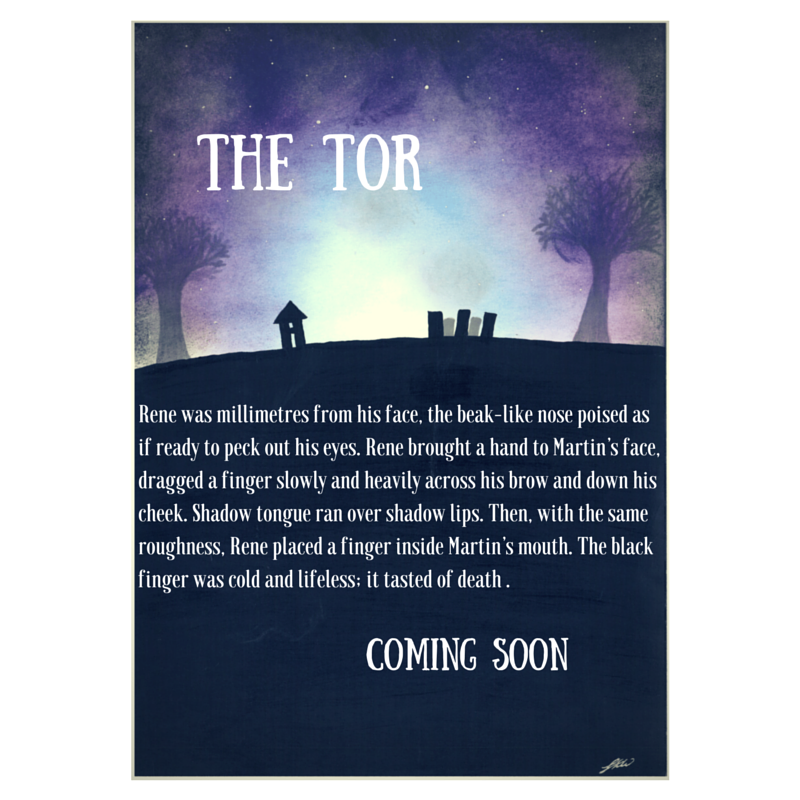 Still coming soon… The Tor! It’s been a busy couple of weeks here, writing wise. I’ve added several new ideas to the “to write” list, written a couple of short stories (one of which is going to be published in a brand new magazine, one of which I’m still waiting to hear back about), had a piece of flash fiction selected as QuarterReads’ free story of the week, sketched out most of the ideas for my Reformed sequel, more-or-less completed drafting the structure of a sci-fi horror I’ve been thinking about (title TBC), and finished the first draft of The Tor. Phew! I say ‘finished’. I’d envisaged The Tor to be a two-part series, but the follow-up (which was to be entitled Dadeni Cottage, and focus on events taking place at the cottage) looks like it may be too short to be a stand-alone novel/novella, so I’m writing it into the novel proper. I’m going to finish that final part over the next few weeks, and then concentrate on other stories for a week or two before returning to The Tor for the final edit and proofread. So The Tor will be arriving later than planned. Bad news? Not really. What was to be a fairly straightforward supernatural horror is now a less straightforward supernatural horror taking place over about thirty years of so, and encompasses two generations of the same family – as well as several recurring themes and characters (yes, the idea dump is that well developed, for the most part. I already know which characters will appear in other stories, and which themes are going to reach across novels). It’s all in my head, and in more detail than I realise once I start writing – I just have to get it down on paper now! Speaking of which, I’m off to tinker with The Tor a little. Well, I finished IT last night…. the ending was a letdown as I expected. All that build-up, all that flitting to between childhood and adolescence, and all for a fight that was pretty much the same as that which they went through as kids; except that this time they won, for no discernible reason. And then Stuttering Bill’s wife got better after he took her out on his old pushbike because…. well, no reason really. There was no real internal logic behind the ending, just a …vague message about good always winning. I think the problem with a lot of King’s novels (Bag of Bones and Insomnia also had the same problem) is that he always cops out by talking of the characters acting like pawns on a chess board, the feeling that they are following a predestined path – in other words, it would have worked out okay no matter who the lead hero was. People get selected to be the hero for no particular reason – there’s no responsibility for what they do. He is a big believer in god, and that’s probably part of the problem: things moving in mysterious ways, people following paths they may not fully understand, etc. I’m just over 100 pages through The Stand, and it’s already going the same way. I think therein lies the true horror of Stephen King’s world. We are none of us fully in control of our destinies. Decisions are mad for us, paths are laid out before us; and many heroes are unwilling heroes, guns aimed and fired by a higher force. Roland from The Stand fits this template too, as does the main protagonist, Ralph, in Insomnia. It’s a scary thought; many of the antagonists are ruled by the opposite of whatever this force is (Henry Bowers, for example) and yet are punished horrifically as if they made conscious decisions to act in they way they do. The other problem with IT is that the build-up and the psychological horror elements are always gripping; but oddly for a horror writer, when it comes to the visually scary bits (e.g. reanimated corpses, rotting corpses, half-eaten corpses, ghosts) he describes them in great detail but they’re never that scary or stomach-churning. Even the descriptions of people dying from the superflu in The Stand are a bit mundane. Compare that to what Annie Wilkes did to the writer (another recurring theme for Mr King – they say ‘write what you know’, but how many writers have been in peril in his books? ); or the kids running from the bullies in IT; or how the farmer deals with his wife’s murder in Full Dark No Stars; or what Percy does in The Green Mile, and it’s clear he’s much better at the psychological stuff than the out-and-out ‘horror’ elements – he just doesn’t seem to know what to do with it once he’s got it written down. I’m enjoying The Green Mile at the moment (only about a quarter of the way though it, though); but I’m yet to come across a King novel worth reading twice. Somewhere in England lies the small village of Batsford. Unknown by many, it hides a dark secret from all outsiders. Can James escape the tor alive? Can Eddie and Martin rescue their school friend Tony? Can they unravel the mystery of the tor to prevent more lives ending? Who is the mysterious old man who appears to know its dark and bloody history? And what is the tor’s link to Dadeni cottage? Can anyone stop the tor from rising again? This book is described as a short story collection. But it’s not. It’s a novel. And quite a good novel. It’s one of the best sci-fi books I’ve read, and I’ve read quite a few. The only reason I didn’t give it 5 stars is because of the short story structure. It would have been a better book if it was written as a novel, instead of segments of a novel. This story is about the future of criminal justice. About pre-crime justice technology. And of course, aliens. You can’t have a sci-fi story without aliens, right? Reformed – is a Matrix prison.